My uncle, Noie, and his wife, Janice, were here from Michigan’s Upper Peninsula for a visit and a little fishing. We fished the river close to town on Friday during the middle of the day and caught three nice walleyes. That evening we only caught one small walleye. Saturday morning we headed for the Lake about 10:00 on a picture perfect day. On a report that fish were being caught in 20′ of water in front of the Gap we started fishing in that area. We caught a few Sauger (bonus fish) and kept five; a couple were quite nice. We then moved down Pine Island and began trolling with crawlers. We found some walleyes in 12′ to 13′ of water and had eight when we went back to the landing for a lunch break at one of the resorts. After lunch we went back out and found the walleyes had moved to shallower water. The closer we got to shore the nicer the fish. We kept eight to fill our limit; all in the 14″ to 18″ range. 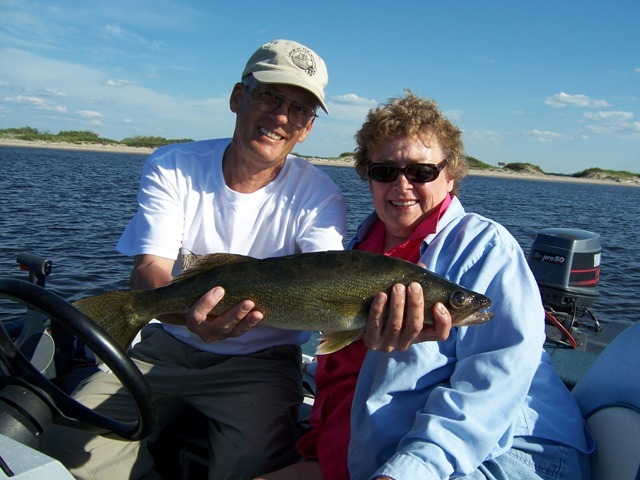 Janice caught a beautiful 24″ walleye that was released to be caught another day. On Sunday, after a nice fish fry and with threatening thunderstorms, we decided to fish the river late afternoon. We caught about ten walleye and sauger and kept four; just eaters. We also caught three sturgeon; one was 44″; a big fish.